Can you believe that tomorrow is the last day of 2013? This year absolutely flew by! The older I get, the faster time seems to fly. I hope you all had a wonderful holiday season. We had a lovely Christmas, but I came down with an awful cold this weekend, so I am feeling pretty miserable today. I'm hoping to feel better by the time we usher in the new year. In the meantime, here's what I am currently obsessed with. 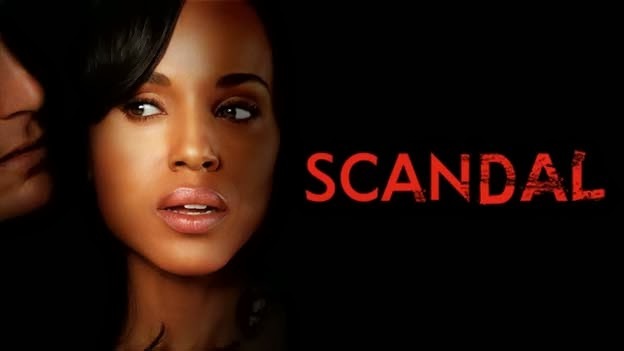 TV Show(s): I am newly obsessed with Scandal! I binged on all of the episodes on Netflix and Hulu and watched every episode so far in about 10 days. I can't wait for it to come back. It's juicy, full of suspense, and Olivia Pope's wardrobe is fabulous. Song: I spent most of this month listening to Christmas music. My two favorite Christmas songs of all time are Mariah Carey's "All I Want for Christmas" and Brenda Lee's "Rockin' Around the Christmas Tree". Instagrammer: I am so hooked on Instagram. I just love the visual aspect and getting a sneak peek into what people are doing. I follow quite a few people and have a lot of favorites, but lately, I've been loving Miguel Flores-Vianna's account. Miguel is an incredibly talented photographer who has shot for every important shelter publication and who lives a jet set lifestyle, regularly visiting and capturing some of the most beautiful places in the world through his lens. Pinterest User: Gabrielle Savoie of Savvy Home always has fabulous pins and I find that we have very similar tastes. Fashion Muse: Kate Moss. Sure, she's made some unsavory choices in her personal life, but her style is flawless. Inspiring Designer: While Aerin Lauder isn't an interior designer, she has done an extraordinary job of building her lifestyle brand, AERIN over the past year with her foray into home decor. Her collection includes exquisite fabrics, rugs, furniture, and lighting proving that she can go way beyond beauty. Aerin's first book, Beauty at Home was released this fall and is my favorite new book of 2013. Color: I'm currently loving various shades of green-- more on this soon! Inspiring Quote: One of the quotes featured in my "Wise Words for 2014" list from this morning is currently resonating with me as the new year approaches: "Never allow waiting to become a habit. Live your dream and take risks. Life is happening now." Triumph: I think I did a pretty good job with the gifts I got for family and friends this year. 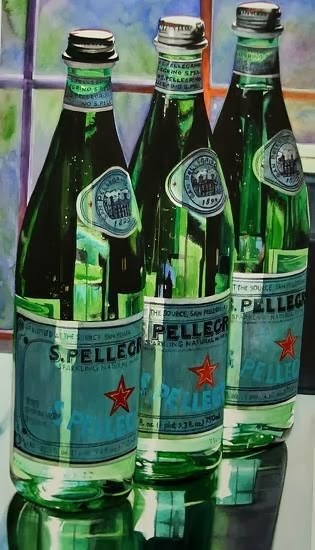 It makes me happy to give thoughtful gifts and to see the recipient enjoy them! Bane of Existence: This heinous cold. When my husband asked me how I felt this morning, I told him that yesterday I felt absolutely miserable and today I feel terrible, so I am getting better slowly but surely. 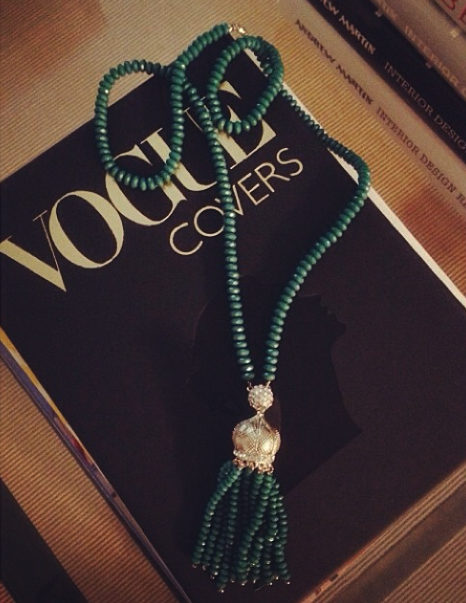 Favorite Accessory: I've worn this green tassel necklace from a bientot quite a bit this holiday season. I love it! Trips being Planned: Fabian and I are currently planning a trip to San Francisco and Napa in either February or early March. We love both places and haven't been there together in a few years, so we are really looking forward to it. Oh man I am so obsessed with Scandal! I binge-watched it too and now I'm so depressed! Now every time I'm shopping I think "would Olivia Pope wear this?" I've tried to fill the void with Revenge but I'm halfway through the first season and I'm just not hooked the same way. I love Scandal too. Beautiful necklace. Hope you feel better soon! I'm trying to conquer a cold too...not fun. We just move to SF about two months ago...it's great fun. I'm sure you will have fun. the necklace is amazing! so so pretty! I hope you feel better soon. I love that quote...and often have that in the back of my mind.